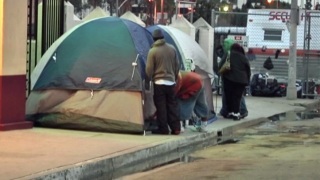 File image of homeless encampments. The Santa Clara County Board of Supervisors approved on Tuesday a five-year program that will provide 360 more homeless shelter beds per year, county officials said. "Our ultimate goal, of course, is to provide permanent housing and services for our homeless population throughout the county," board president Dave Cortese said in a statement. "But we need to shelter as many people as we can in the meantime and especially during wet weather." The program will cost $8.3 million total, including $5.8 million for emergency shelter and services for 130 people a year at the Gilroy Armory and for 125 a year at Sunnyvale's North County Winter Shelter. The board unanimously approved $2.5 million to provide beds and services for 35 families at the Arturo Ochoa Migrant Center in Gilroy, and $3 million to convert a warehouse in Sunnyvale into a shelter. "People need a place to go when the weather is cold and wet. It's as simple as that," Supervisor Joe Simitian said in a statement. "Having this shelter in place for the foreseeable future will help us get people off the streets, and into shelter during the winter months."